Below are Availle's english audiobooks - those that she has read solo. Her tastes go more towards non-fiction, but the few novels she has done are all close to her heart. 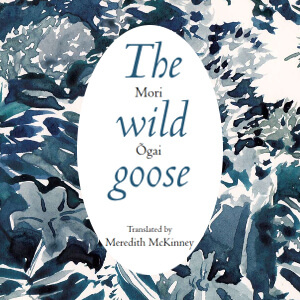 In particular, check out Mori Ogai's "The Wild Goose" right below. It's a modern, coprighted translation of a Japanese classic - and the audio version is only available here! Otama is a young woman whom poverty has forced to become Suezo's mistress in order to provide for her widowed father. When she finds out that Suezo is a married money lender however, she begins to resent him and quietly hopes for a hero to save her. Enter Okada, a medical student at a nearby university who regularly passes by Otama's house. A lucky incident allows them to meet, but will Okada be able to free Otama for good? This is a special project: Both text and audio recording are in copyright! You may download this recording for free, but it is forbidden to sell it, upload it to other (commercial) websites, or modify it in any way, among others. Thank you for respecting copyright! This free recording was made possible by the gracious permission of the publisher Finlay Lloyd and the translator Meredith McKinney. If you like this audiobook, please consider supporting them by buying some of their (other) books - see the links below. Thank you! Finlay Lloyd is an Australian non profit publisher dedicated to encouraging imaginative and challenging writing, to subtly innovative design and to celebrating the pleasures of print on paper in an electronic age. Meredith McKinney is an award-winning translator of classical and modern Japanese literature, whose translations include Sei Shônagon’s classic The Pillow Book, as well as Kokoro and Kusamakura by Natsume Sôseki. A wonderful book of love, duty, and the little things that make a difference. It was fun to read a modern translation for once! 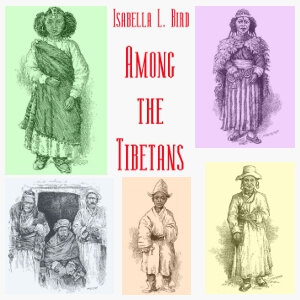 Among the Tibetans was published in 1894 and describes a tour of Isabella L. Bird of a part of Tibet that even today is considered remote and undeveloped. With a keen eye for details she describes not only the breathtaking landscape and the sparse flora, but also the locals and their customs. She tells about special occasions like wedding and funeral rites as well as mundane, daily tasks. On this tour she almost drowned when crossing a torrential river, but despite the resulting broken ribs, she only took a short timeout and then continued her journey. Isabella Lucy Bird (1831 - 1904) was a 19th century English traveller, writer, and natural historian whose travels took her - always alone - to the United States and to the Middle and Far East. 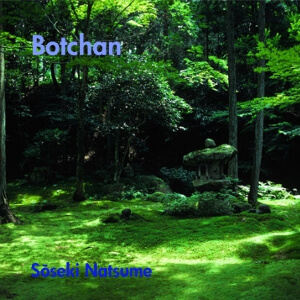 Botchan is the story of a young math teacher from Tokyo whose first assignment takes him to a middle school in the country side. His arrival there is not very lucky: The pupils are bound to test his perseverance and cheerily comment every one of his perceived missteps. In the teacher's room, he soon finds himself in the middle of an intrigue between the jovial "Porcupine" and the fat "Hubbard Squash" on one side, and the effeminate "Red Shirt" and his follower "Clown" on the other. Will Botchan choose the right side in the end? Botchan - with morality as its main theme - is still one of the most popular novels in Japan, and also required reading in schools. Sōseki Natsume (1867 - 1916) bases the story on his own experiences as teacher in Matsuyama, his first assignment away from Tokyo. He ranks among the most famous Japanese writers and wrote a multitude of short stories, but best known abroad are his novels "I am a cat", "Kokoro", and "Botchan". Inazo Nitobe (1862 - 1933) was an author, educator, and politician in the pre-WW II period. 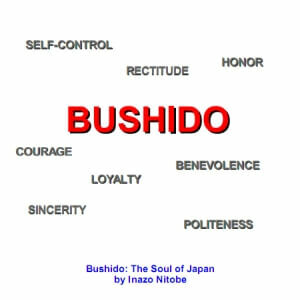 He wrote "Bushido" originally in English for a Western audience; only later was it translated into Japanese. 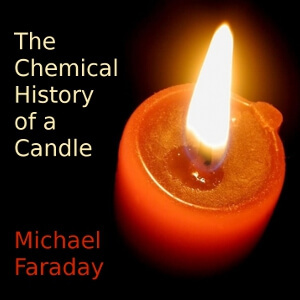 The Chemical History of a Candle is a series of 6 lectures on chemistry presented to a juvenile audience in 1848. Taught by Michael Faraday - a chemist and physist, and regarded as the best experimentalist in the history of science - it is probably the most famous of the Christmas Lectures of the Royal Society. Taking the everyday burning of a candle as a starting point, Faraday spans the arc from combustion and its products, via the components of water and air (oxygen, hydrogen, nitrogen, carbon), back to the type of combustion that happens in the human body when we breathe. The final lecture "On Platinum" describes a then new method to produce large quantities of Platinum. It was delivered before the Royal Institution on February 22, 1861. The famous Michael Faraday (1791 - 1867) is the founder of "The Royal Institution Christmas Lectures" that were initiated in 1825 and today are broadcast by the BBC. Every year a leading scientist is invited to introduce his subject to a young audience. 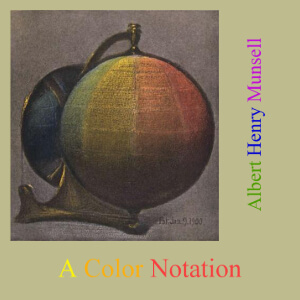 A Color Notation is a method developed by A. H. Munsell in order to produce a unified system of color classification. The system identifies three color dimensions hue (color name), value (lightness), and chroma (color purity) and was the first to base the outcome on a scientifically rigorous method of testing humans' color vision. The three dimensions are depicted on a color sphere with pure hue changing around the equator, value changing from light to dark from the north to the south pole, and choma varying on the inside of the sphere towards the neutral grey of the north-south axis. The Munsell system is still widely used today, for example to define skin and hair colors for forensic pathology, for matching soil colors, or for the selection of shades for dental restorations. 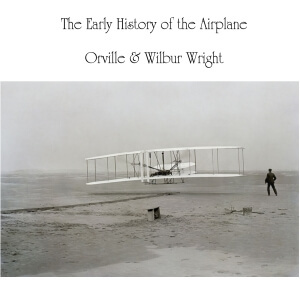 Orville (1871 - 1948) and Wilbur (1867 - 1912) Wright are the pioneers of aeronautics. Starting out from their bicycle shop, they became interested in flying. After hard labour and many fruitless experiments, part of which they describe here - they finally achieved their goal on December 17th, 1903: The first flight of mankind. 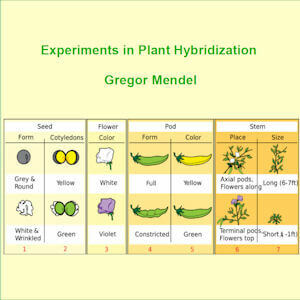 Experiments on Plant Hybridisation is Gregor Mendel's groundbreaking paper in which he presents his results of studying genetic traits in pea plants, the first work of any such kind. Already he differentiates between dominant and recessive genetic traits, whereas the majority of researchers at that time believed in an averaging of the parents' traits in their offspring. Charles Darwin, although searching for a solution for exactly this problem, seems to have been unaware of Mendel's work, and it was only rediscovered at the turn of the 20th century. Gregor Mendel (1822 - 1884) was an Augustinian monk in the St. Thomas monastery in Brno. His work was long ignored and even deemed controversial, however, at its rediscovery it made Gregor Mendel the "father of modern genetics". In January 1909 a friend of the Scientific American paid the sum of 500$ which was to be awarded as a prize for the best popular explanation of the Fourth Dimension. The object being to set forth in an essay not longer than 2500 words the meaning of the term so that the lay reader could understand it. 245 essays were submitted, the 500$ prize was awarded to Lieut.-Col. Graham Denby Fitch, Corps of Engineers, USA, and the essay was published in the Scientific American of July 3rd 1909. Despite the character of the subject, extraordinary interest was manifested in the contest. Competitive essays were received from almost every civilized country. Because of this unexpected interest in the subject, it has seemed advisable to preserve a few of the essays which were submitted. Prof. Henry P. Manning (Brown Univ.) 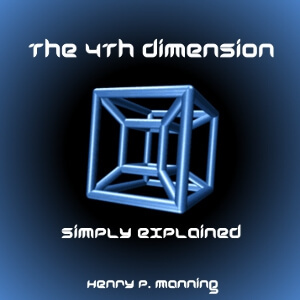 has chosen essays which lend themselves best for the purpose of a popular book on the Fourth Dimension, in other words, those which present the subject from as many different points of view as possible. This book contains 22 of the submitted essays, starting with the prizewinning one, followed by three that received an honorable mention. 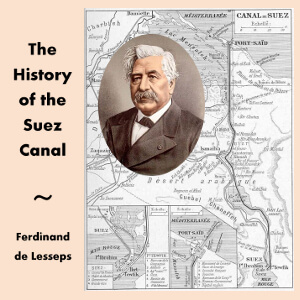 A lively picture of the origin and completion of the Suez Canal (built between 1859 and 1869) and his architect, Vicomte de Lesseps. This is the translation of a lecture given before the Societe de Gens Lettres in Paris, in April 1870 by de Lesseps himself. Ferdinand Marie, Vicomte de Lesseps GCSI (1805 – 1894) was a French diplomat chiefly remembered as the developer of the Suez Canal, which in 1869 joined the Mediterranean and the Red Sea. 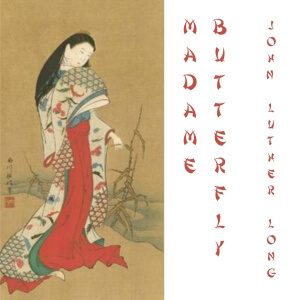 This is a short story by John Luther Long (1861 - 1927), an American lawyer. It is the basis for the famous opera of the same name composed by Giacomo Puccini. 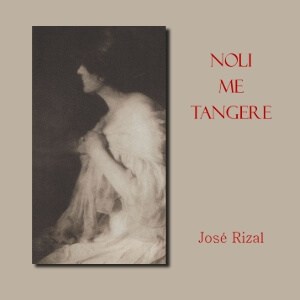 Noli Me Tangere (Latin for Touch Me Not) is the love story between Chrisostomo Ibarra and Maria Clara de los Santos who were set to marry before Chrisostomo left for Spain. When he returns and tries to initiate small reforms in the strictly Catholic country, he quickly becomes the enemy of Padre Damaso, the former local curate. Padre Damaso soon strives to destroy Ibarra by any means possible. Dr. José Rizal (1861 - 1896) is considered the National Hero of the Philippines. The novel, while superficially a love story, is meant to expose the corruption and abuse of the clergy towards the Filipinos. It was banned in many parts of the Islands, and Rizal was finally executed in Manila for inciting rebellion. 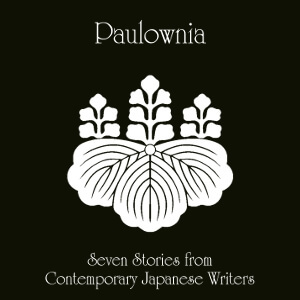 Paulownia is a collection of seven stories by three Japanese authors from the late 19th and early 20th century. Taketomo Torao, the editor and translator of this volume, translated many Western works into Japanese, for example the Rubayat, the Divine Comedy, and works by Shakespeare. He was also a writer in his own right. 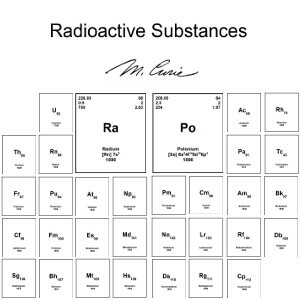 Radioactive Substances is the PhD thesis of Marie Curie. It was presented to the Faculté de Sciences de Paris in 1903, and subsequently published in "Chemical News" vol 88, 1903. All of her research carried out at the Sorbonne that led to the discovery of the new radioactive elements radium and polonium is described in detail: from how she dissolved the minerals out of the rocks, to the measurements of the half life of the elements. Marie Curie (1867 - 1934) was a French physicist and chemist famous for her pioneering work on radioactivity. She was the first person to be awarded two Nobel Prizes - and the only one so far to have received them in two different sciences, for physics (1903) and chemistry (1911). As the risks of working with strongly radioactive materials were not known at the time, she died of a disease most likely caused by radiation poisoning. Polished, elegant, and beautifully enunciated. The Rider on the White Horse, Hauke Haien, is fascinated by the dikes surrounding his home in Northern Frisia. From childhood on he goes there to watch the sea and to find ways of improving the dikes. Only 24 years old, the son of a small landowner becomes the new diekaster - because of his knowledge and hard work. He begins to improve the old dikes, and also works on a new one, despite the misgivings of many of the town folk. For years all is going well, but when a big storm threatens people, land, and dike, the price for a small negligence will be higher than he thinks. 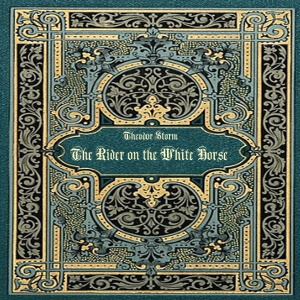 This story inside a story inside a story is considered the masterpiece of Theodor Storm (1817 - 1888), one of the most important authors of German realism in the 19th century. He wrote mainly short stories and novellas set in the places he knew from childhood on. 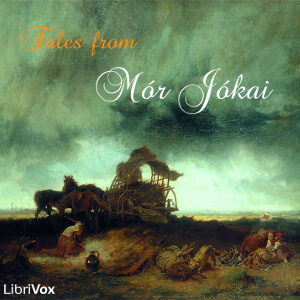 The nine stories in this selection tell about hard times in Eastern Europe, especially in Hungary (Jokai was involved in the Hungarian uprising of 1848), as well as of ancient superstitions and folk lore. In the novella The City of the Beast, Jokai gives his version of the sinking of Atlantis. Móric Jókay de Ásva (1825 - 1904), known as Mór Jókai or Maurus Jokai, was a Hungarian dramatist and novelist. He was a very prolific writer from an early age and wrote hundreds of novels, novellas, and short stories in his lifetime. A Tangled Tale consists of 10 loosely connected stories of an extended family that during their travels encounter mathematical problems, called "knots", that they either solve as recreation or are forced to solve to be able to get out of the hands of not-so-friendly rulers. All stories are humorous and can be solved with a little effort. They were first published in "The Monthly Packet" magazine between April 1880 and March 1885. The readers of the magazine were invited to solve the problems and send in their solutions, which would be discussed in a later issue. 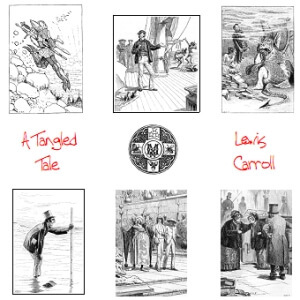 Lewis Carroll (1832-1896) worked as a lecturer for mathematics at Christ Church college, Oxford for 27 years. He ist most famous, however, for his works "Alice in Wonderland" and "Behind the Looking Glass". 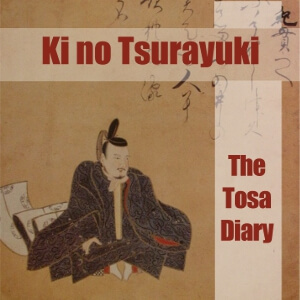 The Tosa Diary is an account of a 55 days journey by boat along the coast of Heian Japan. In Tosa province, Ki No Tsurayuki had served as governor for five years, before he could return to the capital Kyoto. He describes the journey in detail, not leaving out his fear of pirates or his sea sickness and the numerous offerings to placate the gods of the sea. Also included are numerous poems Ki composed during the journey. Ki no Tsurayuki (872 - 945) was a Japanese poet of the Heian period. The Tosa Diary, in which Ki takes the persona of a woman who is "watching him" so he may write the diary in kana (then considered the "women's alphabet"), is considered his major work. He is one of the 36 Poetry Immortals of Japan and compiler of the 905 book "Kokinshu - Collected Japanese Poems of Ancient and Modern Times". This book is the largest scientific inquiry on light and its properties published some 15 years before Newton's Opticks. The main observation in the book is that light is a wave, and Huygens proceeds to postulate a velocity for light (instead of assuming its movement being instantaneous.) He explains that light always travels on the shortest path (i.e., a straight line) when unhindered, and what happens when the ray of light falls on a surface (reflection and refraction). A large chapter is dedicated to his observations of the double refraction in Iceland Crystal - a phenomenon caused by the polarization of sunlight. Huygens uses carefully constructed geometric proofs to verify his experiments and conclusions. 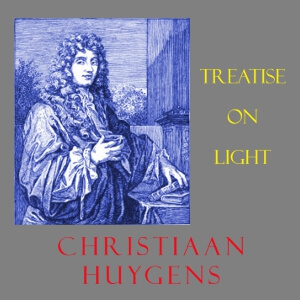 Christiaan Huygens (1629 - 1695) was a renowned Dutch physicist, astronomer, mathematician and horologist. He was a member of the French Royal Society and counted Galileo Galilei, Rene Descartes and Marin Mersenne among his friends. His scientific discoveries include Saturn's moon Titan, the centrifugal force and the laws for colliding bodies. Not an easy book - and I like geometry. My proof listener nominated me for the "LibriVox Hardest Read Award". 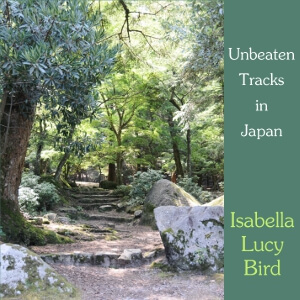 Unbeaten Tracks in Japan is a travelogue compiled of the letters Isabella sent to her sister during the seven months she travelled in Japan in 1878. Starting out from Tokyo (Edo), she first visited Nikko and then turned towards the - as yet by foreigners - unbeaten roads towards Niigata and Aomori. Her account of the poor interior of Japan, where very often she was the first foreign woman the people there had ever seen, stands out among the other travelogues of the time. From Aomori she took a ferry over to Hokkaido (Yezo) to study the Ainu, an indigenous people of Japan. With the Ainu's traditional life all but vanished nowadays, her report about it is highly interesting even to Japanese. Isabella Lucy Bird (1831 - 1904) was a 19th century English traveller, writer, and natural historian. Her travels took her to the United States and to the Middle and Far East. An evocative account beautifully read. Thank you very much Availle. (*) About the text links: The free e-texts from gutenberg, internet archive etc. are the basis for the respective audio books; the books were read from those free texts. However, the amazon links may give other editions that are different to the audiobook. Availle asks for your understanding. Furthermore, the amazon links include an amazon affiliate code: if you shop on amazon via these links, Availle will receive a certain percentage of the price (for books: 4%). This percentage is included in the standard amazon prices, you are not paying more for the book. However, by shopping through those links you support Availle to make more free audiobooks. Thank you!